Given by Antony Collieu on behalf of Charles Lepper. Silk and satin theatre playbills and programmes were produced from the 18th century onwards, to commemorate special evenings at the theatre. Most theatres in the 19th century would have had some made to mark grand openings or milestone performances. By the end of the First World War however the practice had generally died out, only being revived very occasionally, more often at London's opera houses than any other theatres. 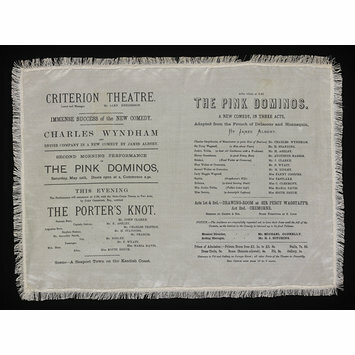 This silk programme was produced for a performance of The Pink Dominos by Charles Wyndham's company at the Criterion Theatre, Piccadilly Circus, the intimate underground theatre that opened in March 1874 and which became known as one of the leading light comedy houses in London. Charles Wyndham (1837-1919) had made his name in London in 1866, playing in a burlesque at the Royalty Theatre. He was in his element in the type of risqué farces often adapted from French originals produced at the Criterion, including Doe and Rose's version of The Great Divorce Case, James Albery's The Pink Dominos and W.S. Gilbert's On Bail. Charles Wyndham (1837-1919) who starred in The Pink Dominos as Charles Greythorne was associated with the Criterion for over 20 years. He first appeared at the Criterion in December 1875 in the comedy Brighton. By Easter 1876 he was a profit-sharing partner in the Criterion, leased by Alex Henderson. Wyndham was in his element in the risqué farces at the Criterion often adapted from French originals, including The Great Divorce Case, The Pink Dominos and W.S. Gilbert's On Bail. 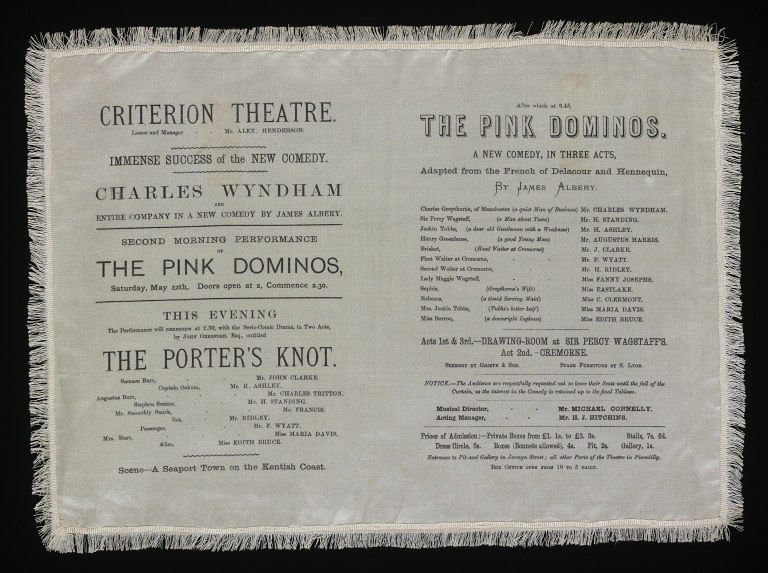 Silk programme on cream silk with narrow cream fringe attached, printed in black typography in landscape format, headed CRITERION THEATRE, Lessee and Manager Mr. Alex Henderson, advertising the forthcoming second morning performance of The Pink Dominos at the Criterion Theatre, 12 May 1877, and giving details of The Porter's Knot by John Oxenford followed by The Pink Dominos by Charles Albery, starring Charles Wyndham as Charles Greythorne of Manchester. The Pink Dominos was adapted from the French of Delacour and Hennequin by James Albery and featured Mr. Charles Wyndham as Charles Greythorne, Mr. H. Standing as Sir Percy Wagstaff, Mr. H. Ashley as Joskin Tubbs, Mr. Augustus Harris as Harry Greenlanes, Mr. J. Clarke as Brisket, Head Waiter at Cremorne, Mr. F. Wyatt as the First Waiter at Cremorne, Mr. H. Ridley as Second Waiter at Cremorne, Miss Fanny Josephs as Lady Maggie Wagstaff, Miss Eastlake as Lady Maggie Wagstaff, Miss Eastlake as Sophia, Miss Camille Cleremont as Rebecca, Miss Maria Davis as Mrs. Jenkins Tubbs, Miss Edith Bruce as Miss Barron. The scenery was by Grieve and Son, the stage furniture by S. Lyon. The Musical Director was Mr. Michael Connelly, the Acting Manager Mr. H.J. Hitchens. The Porter's Knot by John Oxenford featured John Clark as Samson Burr, Mr. H. Ashley as Augustus Burr, Charles Tritton as Stephen Scatter, Mr. Francis as Mr. Smoothly Smirk, Mr. Ridley as Bob, Mr. F. Wyatt as a Passenger, Miss Maria Davis as Mrs. Burr and Miss Edith Bruce as Alice. Tickets for the private boxes and the stalls could be purchased from the Libraries, and also from Mr Massingham at the Box Office. These cost 5/-for the Dress Circle, 4/- for a box, 2/- for the pit, 6d for the gallery and 6/- for the orchestra stalls. Private boxes cost £1.1s to £3.3s, Stalls 7s 6d, Dress Circle 5s, Boxes (Bonnets allowed) 4s, Pit 2s, Gallery 1s. Silk programme for The Pink Dominos by James Albery, adapted from the French of Delacour and Hennequin, preceded by The Porter's Knot by John Oxenford, Criterion Theatre, 12 May 1877. Letterpress on silk.